In an earlier piece some weeks ago, I talked about how good MySalam could be for all Malaysians, especially those who are underprivileged. However, there have been many good programmes and plans that don’t turn out so well when they are implemented. In fact, some turn out to be a disaster. As previously mentioned, the last thing we want is for a good health programme to go belly-up instead of achieving what it is designed to do. There are some possible areas of concern pertaining to MySalam, and I would like to take this opportunity to highlight them so that course corrections can be made early on, to the benefit of all. For members of the public, there is no difference between a university hospital and a health ministry hospital. They all “belong” to the government, don’t they? Currently, MySalam does not allow patients at university hospitals to make claims for treatment or hospitalisation. University hospitals are not covered in the programme. This is an extremely short-sighted move that really impacts patients, especially in areas where university hospitals take up a huge service burden of being the primary place of treatment. This is true of all university hospitals, whether UKM in Cheras, USM in Kubang Krian, or UM in Petaling Jaya/Lembah Pantai. 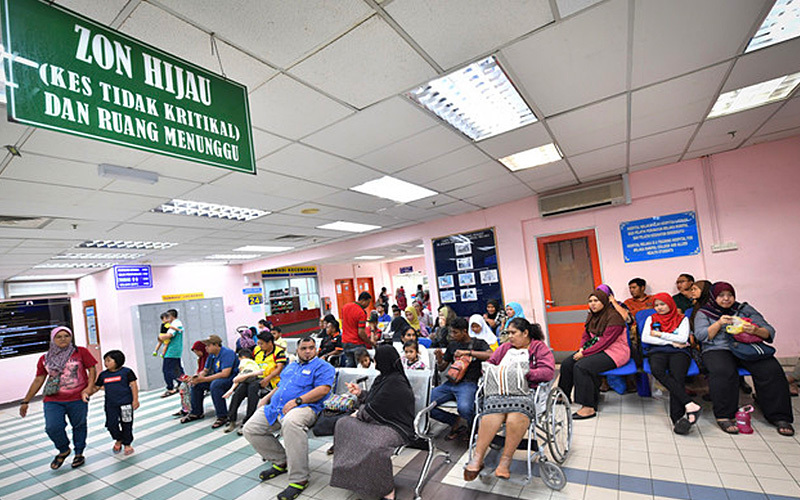 These hospitals are the primary reception point for Malaysians living in the area, and in many instances, the only places with the sub-speciality expertise needed to treat complicated cases. There is a difference in terms of treatment charges between university hospitals and government hospitals, but since MySalam is paid directly to the recipient and not based on the cost of treatment, why should this matter? Currently, the scheme only includes those aged 18 to 55. National data, as seen from studies such as the National Health and Morbidity Survey, shows that the onset of chronic disease for more than half the population begins in their 40s. Complications such as heart attacks or strokes may only begin to manifest in their late 50s. By excluding those above 55 from the scheme, we may actually be cutting off aid to those who need it the most. It is heartening to note that Maria Chin Abdullah, who attended the briefing session in Parliament, raised this concern, and that Finance Minister Lim Guan Eng promised the upper age limit would be reviewed. We hope that the review is speedily done and considers the needs of patients rather than economic cost alone (i.e. that more payouts may need to be made). I may be criticised for saying this, but I think we need to be aware of the IT capabilities of underprivileged Malaysians, especially those in the older age group. Data is often cited on how smartphone penetration is high in Malaysia, and how almost every Malaysian has some kind of a phone, but let me affirm here that having a smartphone does not translate into having good phone literacy, that is knowing how to use it. One of the good things about MySalam is that it removes bureaucracy and red tape by allowing recipients to upload their claims on the website. This saves them hours of queuing and dealing with counter officials. But they may also face difficulties negotiating the electronic hurdles involved. This was seen in the E-Kasih programme, a welfare scheme targeted at the same demographic as MySalam. What NGOs found on the ground then was that potential recipients did not find it easy to make submissions/register due to a lack of technical capability. In fact, many of us worked for months to run a service for underprivileged households, to help them register for the programme online. This is something that we NGOs would be more than happy to continue doing for MySalam if the government wishes to engage us. I understand that the finance ministry will put counters at hospital lobbies to overcome this possible hurdle, but I’m afraid it might not be enough, or, even worse, that it might cause congestion that increases red tape and undermines any benefits of having an online programme. Many people are worried about what will happen once the scheme has run for five years. In the event that another insurer does not enter the picture, will everyone on the ground stop being covered? Will it end overnight? The government has not been able to provide clarity on this, which by right it should. Assure us, the people, that the scheme will be continued by the government irrespective of whether Great Eastern or another insurer takes it up. That would be a move made in good faith, and would show us that the government is genuine in its interest in taking care of the people, and that this is not just a flash-in-the-pan scheme. One of the greatest benefits of MySalam is that it provides some sort of financial risk coverage for an entire segment of the population who were hitherto uncovered. But this may also be its Achilles heel. The insuring entity now has access to the information and data of the 3.7 million people registered under the programme. The question is: is there the possibility of an opportunity to abuse or misuse this data? The answer is, yes. Something along the lines of offering MySalam recipients poorly designed, short-term, ineffective insurance products through targeted marketing would be as easy as pie. In Parliament, representatives of the finance ministry assured us that “this is being looked into”, and that “the data will be protected” – but really, firm assurances consisting of clear, transparent strategies for data protection must be made available for all of us to be convinced of the safety and security of the data. I have personally spoken at more than 30 communities and small towns since Jan 1, when MySalam came into effect. Of these, only two communities had individuals who knew about the programme. I don’t claim to represent a national sample, but this, to me, is a worrying qualitative indicator. As I understand, the finance ministry is doing the rounds to promote awareness of MySalam, but the people do not seem to know about it. Years ago, the first time Socso put out a health screening voucher for its subscribers, there was poor take-up. Even the Peduli Sihat scheme in Selangor is under-utilised. There may be separate factors related to each of these situations, but lack of awareness is definitely one of them. All the wonderful health programmes in the world will come to naught if people are not aware of them. In fact, this does a lot more harm to future health programmes as they will have to contend with a bias that such programmes “don’t work” and that “people don’t want health programmes”. Most of the time, it’s not a case of people not wanting, but people not knowing. Again, working at the community level through NGOs and civil society partners may be an easy, cost-effective strategy for the government to promote the scheme as quickly as possible. At the risk of sounding like a broken record, please allow me to repeat myself. For some, it has become almost too easy to dismiss any criticism of the government’s strategies or programmes as “enemy talk”. But rolling out a poorly executed initiative, be it MySalam or any other, will doom it to failure from the onset and cause a backlash that will erode confidence in the government over the long term. That’s what these suggestions are: constructive criticism and good advice, offered in good faith. Will they do any good? Dr M Murallitharan is a public health physician and medical director of the National Cancer Society Malaysia.